MARION COUNTY, OR – The arrival of fall typically signals the seasonal closure of several Marion County parks. This year, for the first time, a second parks program employee has been hired which will allow a number of parks that are normally closed for the season to remain open. Russ Dilley, parks coordinator, said, "We receive requests every year to keep some of our seasonal parks open but we've been unable to because we've only had one employee to maintain all the county parks. This year the Marion County Board of Commissioners approved an additional full-time parks employee, which means we'll be able to expand and improve our services." 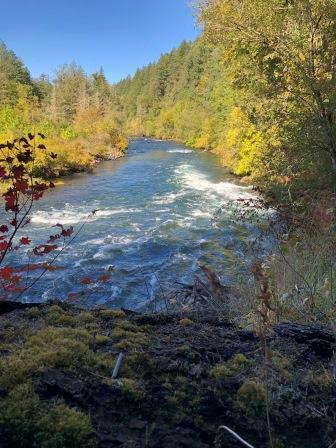 Bear Creek, North Fork, and Salmon Falls parks, which are all in the North Santiam River Basin. On November 1, the gate at Scotts Mills Park will be locked for the season, but like St. Louis Fish Ponds which closed for the season on October 1, people will be allowed to walk in. Visitors should be aware that the restroom facilities at both parks are not available. For more information these county parks, including descriptions and locations, visit the Marion County Parks web site at http://www.co.marion.or.us/PW/Parks/ or call (503) 588-5036.